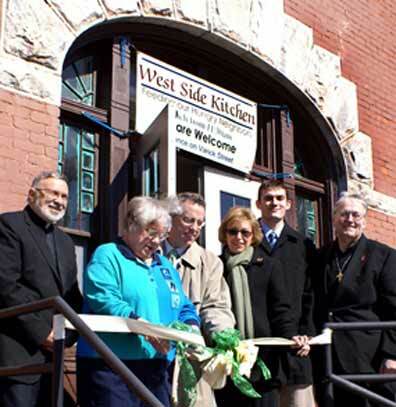 UTICA, NY, March 19, 2011  Mother Marianne’s West Side Kitchen is celebrating its third anniversary this month, having served over 70,000 meals since opening its doors in March 2008. But soup kitchen Supervisor Vicki Montalbano says the real milestone is the 70,000 blessings. "Volunteers find themselves in a privileged place," she says. "The people being served are a blessing." Some 100 guests and volunteers gathered March 10 to mark the occasion with fellowship, a meal and a birthday cake. "All were so happy to share this milestone together as 'the Mother Marianne Family'," she notes. The soup kitchen is located in St. Joseph-St. Patrick Parish Center on Columbia Street and is named after Blessed Mother Marianne Cope, the Franciscan sister who grew up in West Utica and devoted the last 30 years of her life to the lepers of Hawaii’s Molokai. The all-volunteer operation serves soup and sandwiches from 11:30 to 12:30 Monday through Friday, and a bag lunch on Saturday and Sunday. The soup kitchen remains self-sufficient, and "that's a tribute to the generosity of the Utica area," notes Deacon Gil Nadeau, the founding director. "It's also a ministry, driven by the Gospel call to see Christ in others and to meet need where it exists. And the working poor, the unemployed, the homeless remain in our midst." After serving over 70,000 meals, "our volunteers and guests will never be the same," Montalbano adds. "The blessings flow from the kitchen and we are grateful to be able to serve. After all, who we serve are on our Lord's guest list, and all are welcome."